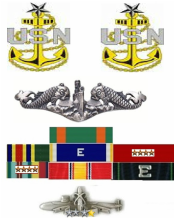 Jerry Plotts FTCS(SS) USN RET. United States Navy 1968-1989. Proud member of the Navy's Elite Submarine Force providing a strategic deterrent to cold war aggression. 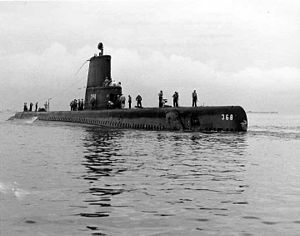 I served on the USS Jallao (SS368), USS Kamehameha (SSBN 642 Blue and Gold), USS Andrew Jackson (SSBN 619 Blue), and USS George C. Marshall (SSBN 654 Blue). I entered the Navy as a Torpedoman, and Retired as a Senior Chief (E8) Fire Control (Missile) Technician. After retiring from the Navy, I worked for General Dynamics/Electric Boat in Groton, CT for 10 yearsas a network analysis Engineer and Interactive Trident Training Course ware Developer, then went to work as a Computer Systems trainer at Pfizer, Inc. I finally finished my working career as a Database administrator at Pratt and Whitney in Middletown CT. Additionally, from 1998-2008, I served as an assistant Pastor in several local churches here in South East Connecticut. I'm now fully retired and living in Ledyard, CT with my wife Terry and enjoying life to the fullest. If you want to contact me, email me at jerryplotts AT yahoo DOT com. The Computer is an Alienware with 8GB ram, 1 TB of hard drive space. The monitors are a pair of Dell 24". My video card is a nVidia GTX 645 with 1GB. The monitors are both connected to a Matrox DoubleHead2Go Digital. This allows 3840 x1050 resolution, so the display is treated as a 48" display. The panel to the right is an 8x10 photo with a thin sheet of plexi-glass mounted over it. Holes were drilled and switches mounted through them, and connected to a USB interface board from Desktop Aviator﻿. A laptop is connected via WideFS and displays LittleNavMap (Flight Map tool) GPS, or whatever I need) on the monitor to the left of the double screen. The Desktop frame is 1: PVC pipe. The plans are from Roger Dodger Aviation. In the lower picture you can see the additions from Desktop Aviator. The Cessna Combo panel, the Landing gear, flaps, parking brake, and fuel select panels. Makes flying the Cessna or other small aircraft very realistic. Thanks to Matt Thomas of Roger Dodger Aviation for the plans for these great project to make the sim more immersive! Click on the picture for more information on how to get the plans for this project. This picture shows the throttle stand as well as the Collective control and the Center mounted Cyclic control. All made with 1" PVC pipe. The Collective is the Thrustmaster T-Flight Hotas X Flight Stick that has a detachable throttle. I'm not using the joystick part of it, so it's sitting on the floor just in front of the Collective control. The Cyclic and additional throttle is a Saitek X52 pro. Mounted above the radio panel is a Saitek Engine control panel, This enables me to control fully a single engine aircraft like the C172. Not 100% accurate, but 100% functional. The panel is loosely modeled for the Dodosim Bell 206 Helicopter. The full startup and shutdown checklist can be done without using the mouse or keyboard. Added this 7" LCD monitor. This will enable me to put the FMS or GPS onto the display and still run FSX in full screen. This monitor once had life as a DVD player screen for a car. I got for about $80 on amazon. I run it at 800x600 which is perfect for this application. The left picture is the FMS in the Majestic Dash8 Q400, and the right picture is the standard GPS500 with the Airbus 321. Attached to the computer are over 20 USB devices including: GoFlight MCP Pro, GoFlight T8, P8, GF166, RP48, GF46 and LGT modules. Also the Go Flight MESM to the left of the radio. 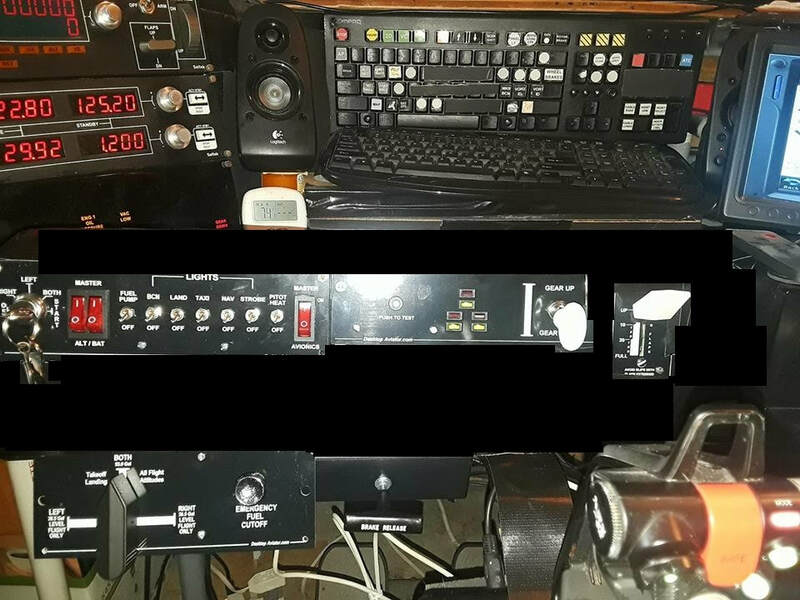 A Saitek Backlit Information Panel, and the Saitek Flight Informaton Panel. The GPS unit in the center above the yoke is available from Desktopaviator.com. It sets up easily and configures in a snap. Throttle stand and closeup of the FSX Throttle system. Almost like the real thing in feel and operation. I found a graphic on-line of the labels. Printed them on a sheet label and then them covered in clear tape before putting them onto the throttle. This helps decrease wear from the hands moving the throttles back and forth. The stand is made from light wood and painted Boeing gray. The Trim Wheel on the side is functional and is part of the Throttle Quad from FSX Throttle. mounted on the side of the throttle stand is a checklist holder that I keeps my checklists and approach plates in for use during the flight. Thanks to my good friend Den Bacchiocchi who built this throttle stand for me. You are the "MAN". This is closeup of the FSX Throttle Quad which has realistic throttle handles and Thrust Reverse levers as well as Notched Spring Loaded Flap handle. The speed brake lever is also fully functional allowing positions from armed to full deployed. The trim wheel makes two complete revolutions before a mechanical stop allowing for use of the trim system. There is also an Auto Throttle (A/T) on the #1 Throttle handle, and a Take Off/Go Around switch button just below the #1 Throttle. Engine Fuel Cut Off switches, and a parking brake lever are located on the lower section of the unit. All totally functional. It comes by default in this Boeing gray which is perfect for the system. In this screen I'm en route from KLAX to KMSP. Operation is straight forward. The buttons on the GPS are assigned via FSUIPC and work great. No more mouse clicks on the GPS at any phase of the flight. Click on the image to see more information about this fantastic unit! This is an attempt at a panoramic stitched image of the Small aircraft/ Helo flight deck. The monitor at the far left is displaying a navmap of the flight and is driven from the laptop at the far right. This laptop is used to run the navmap program, connect the flight logging software, as well and log book keeping for the flight. This is around the spring of 2007 when I first got started with the idea of expanding the flight deck. A CH Products yoke and pedals, with a Saitek Throttle quadrant. The main display was a 20" LCD monitor and a 19" tube monitor to the right. It was rudimentary, but it started me to where I am today! A Commodore 64 computer, color TV 13", and 5 1/4" floppy drive. This was about a $600 investment at the time. I used the Sublogic Flight Simulator which was on a single 180K floppy disk. How things have changed. Now Flight Simulator X is on 3 DVD's and you can't even buy one for less than about $200.